Chinese smartphone manufacturer OPPO keeps churning out new phones left, right and center. Recently, a brand new unknown OPPO smartphone has been spotted on Chinese certification site TENAA. The phone doesn’t have any name yet, but goes by model number PCDM00 and PCDT00. There are two variants of this phone listed on the website. The site also reveals the phone’s specifications and design. As per the specifications listed on TENAA, this new OPPO smartphone is most likely a budget device. 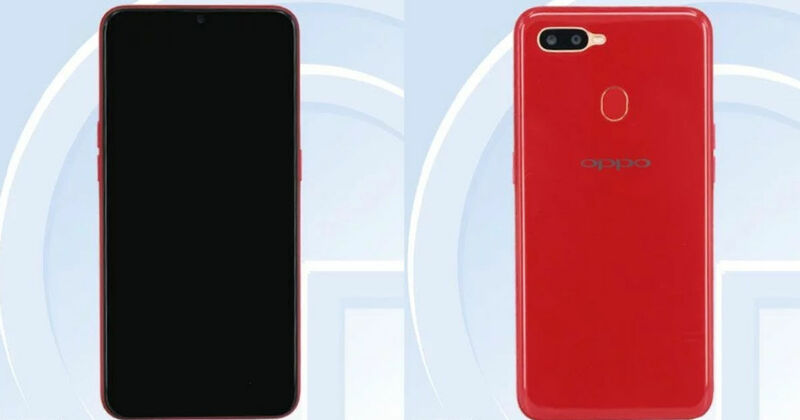 It looks similar to other recent OPPO devices and also has a v-shaped teardrop notch on the front. The phone seems to have a polycarbonate body that should be available in various colour options such as Blue, Black and Red. It also has gold accents around the camera module and the rear mounted fingerprint scanner. The phone will come with a 6.2-inch IPS LCD display with an HD+ resolution and will weigh about 170 grams, according to the listing. It will be powered by the octa-core MediaTek Helio P35 chipset that is clocked at 2.3GHz. This processor will be paired with up to 4GB of RAM and 64GB of internal storage. A microSD card slot is also available for storage expansion. Coming to the camera setup, the device will feature a dual-rear camera setup with the sensors placed horizontally. It will have a primary 13-megapixel sensor paired with a 2-megapixel depth unit. The main rear camera will only record 1080p videos as there is no support for 4K. On the front, a 16-megapixel camera is present for selfies. The phone will be equipped with a 4,100mAh battery, but we are not sure if it will feature any fast charging tech. The phone will run on Android 8.1 Oreo with OPPO’s own custom skin on top. This is disappointing since most phones in 2019 are expected to come with the newer Android 9.0 Pie OS. We are not sure when OPPO plans on launching this new phone and we have no idea what it could be called. If you are interested, stay tuned while we wait for more details.